Antique beds have remained a popular part of interior design, mainly due to their inherent grace and unique appearance that makes a statement within a room. Bedrooms are generally seen as a sanctuary from the trials and tribulations of everyday life, and having a peaceful and welcoming place to retreat to at the end of a busy day is high on the list of most householders. The great thing is that these older styles of bed – from elegantly painted French styles to traditional sleigh beds – are still widely available both on the high street and from online retailers. Searching sites such as ebay.co.uk allows you to view the massive range of bed frames available, and is especially good when looking for genuine antiques and second hand beds. Even if we are intent on embracing contemporary design ideas, the subject of antique style is closer to our hearts than we think, as Heart Home magazine explains. 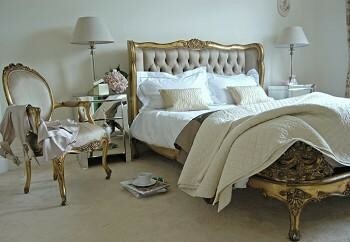 Let us take a look at a range of antique beds that would look good in any style of bedroom, whether modern or vintage. Louis XV and XVI’s era brought a light elegance to bedroom design. Beautiful headboards, shapely carved feet and flowing lines created the distinctive, romantic French look we all recognise today. Footboards were generally caned or upholstered, and complemented other decorative elements in the room. The Victorian age produced bedsteads made from wrought iron and brass, which were aspired to by householders of the time. The craftsmanship that went into making both metal and wooden beds resulted in them becoming a symbol of wealth, with four-posters and sleigh beds being the ultimate purchase. Wrought iron beds are still considered luxurious today, and their association with good quality has remained. This feature from House to Home magazine illustrates just how an antique wrought iron bed adds a peaceful ambience to a light and sunny bedroom. 1920s and 1930s art deco style was influenced partly by Hollywood glamour. Striking monochrome angular styles became common in interior design, with art deco beds also having button-studded and upholstered bed heads. This type of bed would suit a light and airy bedroom, and a sumptuous look can easily be created using bedspreads and throws similar to those popular at the time. Shimmering velvet throws and beautifully soft blankets layered on top of crisp white sheets, bring back an image of the heyday of glamour, and this must be one of the most copied styles in modern times. Although new bed styles appear all the time, antique beds such as these retain their popularity, confirming that our descendants knew a thing or two about good design. Beautiful craftsmanship and an effortless sense of style have created these pieces that are still aspired to by many. Exuding a sense of romance and nostalgia, these beds have a timeless appeal for modern homeowners. The fact that an entire bedroom can be designed in a vintage style, whether that is art deco, Victorian or Regency, makes the bed the most important focal point of the room.